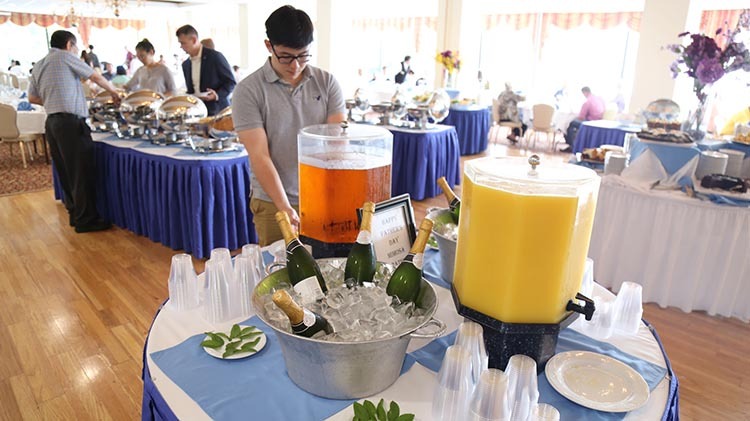 Date: Apr 28 2019, 10 a.m. - 1 p.m.
Start a family tradition by taking part in the Officers' Club Sunday Brunch which includes a delicious waffle station, omelets, roast beef, bottomless mimosas and more! Brunch is served every Sunday from 10 a.m. - 1 p.m.
Reservations are only required for parties of 10 or more. The Dress Code is business casual. Please no jeans or sneakers. *This event is open to all DoD ID Card Holders and their Guests and Installation Visitors. Non ID Card holders must enter Tulley Gate Visitor Center between 5 a.m.-9 p.m. For more information you may call the Visitor Center at 703-806-4892 or visit the Gate Access page. Non-DoD ID card holders may go to the visitors gate a few days ahead of time to get a pass. This will allow for faster entrance on the day of an event and prevent gate access from backing up. Tulley Gate Visitor Center is open between 6 a.m.- 4:45 p.m. Mon-Fri.